Derbyshire County Cricket Club press day. 'In their 20/20 kit from left, back row, Jonty Norris, strength and conditioning coach, physio Fran Clarkson, Tom Wood, Will Davis, Greg Cork, Rob Hemmings, Charlie Macdonell, from left, middle row, development coach Mal Loye, Tom Taylor, Luis Reece, Harvey Hosein, Tom Milnes, Matt Critchley, Ben Cotton,Steve Stubbins the first XI support coach and their scorerJohn Brown, from left, front row, Ben Slater, Alex Hughes, Tony Palladino, Billy Godleman, Wayne Madsen, Shiv Thakor and Daryn Smit. Wayne Madsen believes Derbyshire can hold their heads up high after defeat in the quarter-finals of this year’s NatWest T20 Blast. The Falcons were knocked out of the competition this week by a Hampshire side who went run-crazy at the 3aaa County Ground with a place at Finals Day on offer. But Madsen was keen to look at the positives from their 2017 white ball campaign, which saw eight T20 wins and a second place finish in the North Group. He said: “It’s probably been our best season ever, we had eight wins out of 14 games which is pretty consistent in this form of the game and we had some very big wins. “We’ve been excellent at home for the most part and we can be proud of how we played our cricket this year in T20. Derbyshire lost to Hampshire by 101 runs thanks largely to an incredible display of batting from Shahid Afridi, who hit 101 as his team made 249-8, and 3-25 from Kyle Abbott. “It’s a disappointing way to end but when someone plays like that, in this game anything can happen and anyone can have their day and he played brilliantly this evening,” said Madsen. 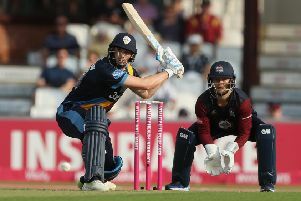 Madsen was his county’s stand out performer in the competition; scoring four half centuries and becoming the first Derbyshire batsman to score 500 runs in a T20 season.